The smart watches are fashionable and manufacturers are increasingly embarking on this new market. However, few smart watches offer support for Windows Phone, and generally they use to be limited to Android and Apple. HOT Watch is one of the few exceptions. 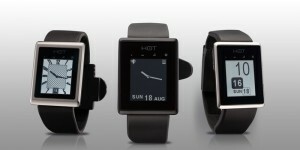 Last week, PH Technical Labs announced that they were developing a Windows Phone app to support the new HOT Watch. This company, responsible for developing the new smart watch, has affirmed to be working in partnership with Microsoft to launch the app on June 30th. Watch HOT (Hands -On -Talk Watch), is the result of a successful Kickstarter campaign that raised $ 616.231 last summer, widely exceeding the initial target of $ 150,000. The main feature of this smart watch is that it is the only one on the market that offers the possibility to make private phone calls, thanks to a patented technology. 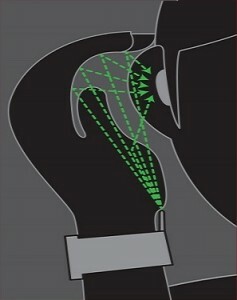 As shown in the diagram, the watch features a directional speaker on the inner side of the wrist that sends the sound to the palm of the hand. When placed correctly, the hand amplifies the signal and directs it towards the ear. The microphone is located at the opposite end, thus avoiding any echo that may be coupled from the speaker. In addition to this particular technology, HOT Watch is water resistant and features a SHARP e-ink 1.26-inch screen with high contrast, Bluetooth 4.0, gyroscope and 6-axis accelerometer. It answers to gestural controls, although they can be disabled if we don’t want to use them. With a flick of the wrist we can answer calls, launch the dialer or activate the flashlight. It even has a sensor that detects if we fall to the ground and automatically starts an emergency call (after waiting 30 seconds, to be able to disable the call in case of error). The HOT Watch also includes messaging and social networks services, and basic applications like weather, calendar, news, alarm, stopwatch, pedometer, etc. It connects to the smartphone via Bluetooth 4.0, and currently supports iOS and Android devices. 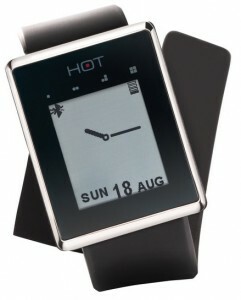 The HOT Watch can be pre-ordered from its web page for a price ranging between $179.55 and $236.55, depending on the model. It is available in four different styles: Basic, Edge, Classic or Curve, with increasing price. The first units will be shipped this June with support for iOS and Android, and by the end of the month the support for Windows Phone will be included. For more information, you can check the company’s website.